Spring is a time for birth, rebirth and reinvention. The TRF is embracing this spirit with the arrival of four new horses into our herd. Over the next three months Joey, Surprise, Candy and Iceman will share their stories of rescue and renewal. Please join us on this journey by following along! Over the next three months we will chronicle their transformation by posting (at least) three times a week on TRF Social Media (facebook, instagram and twitter) to share their progress, their challenges and their milestones with the world. Along the way, we’ll be sharing a narrative version of their journey through this new TRF Blog endeavor. We hope their story of reinvention will travel far and wide. By following along and sharing their story (and this blog) you can help us write the next chapter. The care we provide to these four horses and the 650 rescued and retired Thoroughbreds in our nationwide herd, is only possible through the generous donations of thousands of individuals supporters across the US and around the world. We believe those who are not aware, cannot care. Help us share this story as an example of what is possible when people work together and speak for the horses – who cannot speak for themselves. On March 8th, the TRF staff and one member of the Board of Directors traveled to the location of the horses in need. At the same time, representatives from our colleagues in aftercare were similarly assessing the horses and determining which organization would be the best fit for each animal. 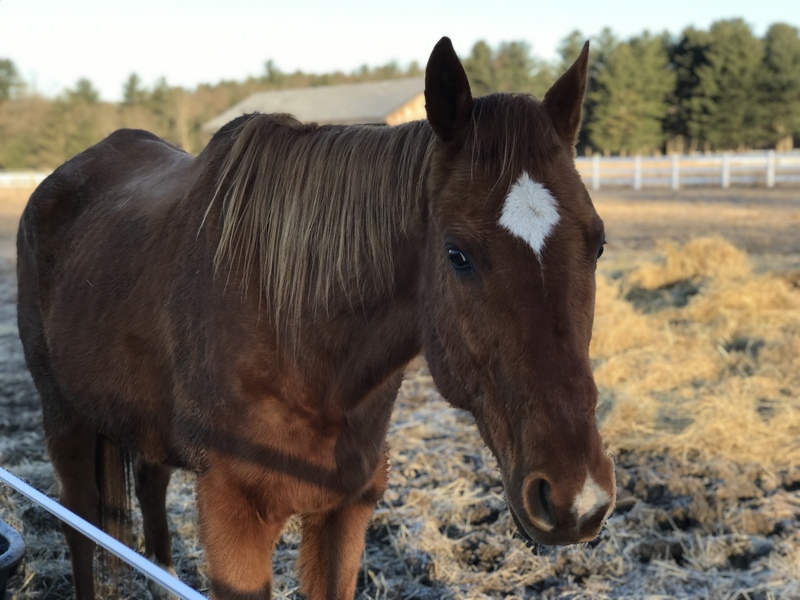 On March 9th, the TRF moved forward with the rescue of two horses who were brought to the TRF Saratoga Summer farm to provide immediate attention to these horses. On that frosty Saturday morning, the TRF welcomed Candy and Iceman to the TRF Herd. 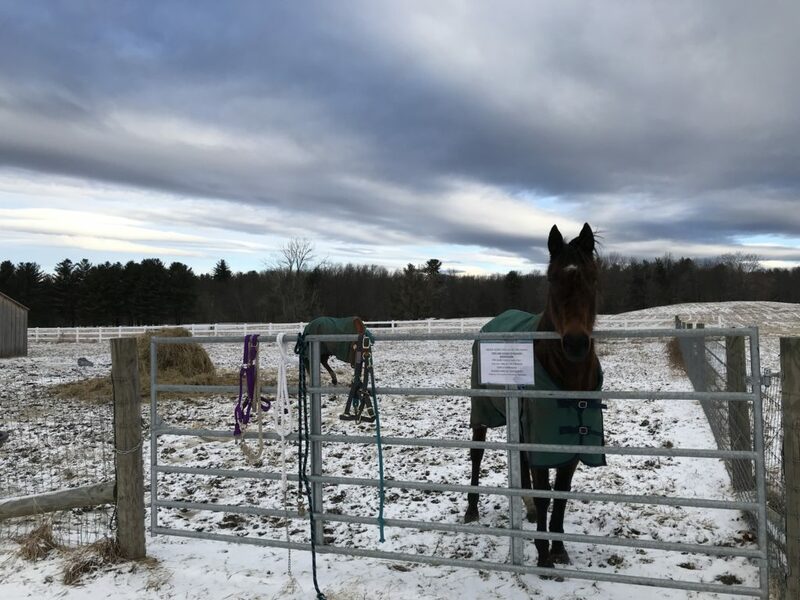 That same afternoon, the TRF Saratoga veterinarian, Dr. Suzanne Jaynes of Equine Clinic at Oakencroft provided an onsite assessment of the horses. She gave both horses a body condition score of “1” and “2” (on the Henneke Body Condition Scale of 1-9). Dr. Jaynes descriptions of the horses included “heavy gastrointestinal parasite burdens” “Severe skin conditions, rain rot and lice” “emaciated”. Invaluable support for this rescue was provided by generous in kind donations from the Equine Clinic at Oakencroft, Gallagher’s Stud, Dr. Rod Stewart, Lukens Horse Transport, McMahon of Saratoga Thoroughbreds and precious emergency funding was received from the Thoroughbred Charities of America Horses First Fund,New York State Thoroughbred Breeding & Development Fund, and New York Thoroughbred Horsemen’s Association. On March 14th, based on continued cooperation with our fellow aftercare organizations, the TRF received two more horses in need. On that Friday afternoon we welcomed Joey and Surprise to their new home at our temporary farm location in Saratoga Springs. And with their arrival this story of Reinvention – the TRF Rescue of 4 Retired Racehorses, had begun! Our intention is for these four horses to remain at our TRF Saratoga Summer Farm through the coming 3-6 months where the TRF staff and volunteers will provide rehabilitative care – and lots of TLC. We estimate that the TRF will incur up to $10,000 in expenses per horse over these coming months as we address the myriad of health issues they are facing. As their conditions improve we will determine their suitability for possible adoption or transfer to available space within the TRF national network of farms and Second Chances programs. We’ll be back soon with an introduction to each of the horses and share a snapshot of their early days in their new home.